How do we test for Leaky Gut Syndrome? It is easy to test for intestinal permeability (aka leaky Gut Syndrome). We use a certified FDA approved and experienced lab. When we suspect leaky gut, we give our patients a kit with complete written instructions from our clinic to take home with them, so that the test can be done from the convenience of their home and mailed directly to the lab for analysis. The patients are asked to ingest a harmless, non toxic solution containing lactulose and mannitol, two water-soluble sugar molecules. This is done over a 6 hour period. The patient then supplies in a small container (included in the kit) a sample of their own urine, and this is used to test for elevated levels of these two sugars. Leaky gut syndrome is very likely if the levels of both sugars collected in the urine are high. Leaky Gut Syndrome is also called intestinal permeability syndrome. 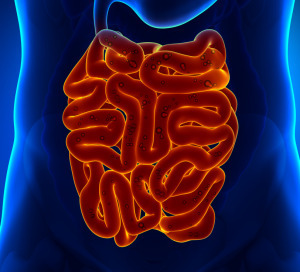 It is much more prevalent than most doctors or patients realize and it is a serious condition because the gut is the largest immune system organ in the body. Leaky gut syndrome then is a health disorder in which the lining of the small intestine becomes much more permeable and porous than it should be, and can allow a wide variety of foreign substances to be absorbed in to the blood stream. These enlarged spaces, formed between the cells in the intestinal wall, then create the condition for the penetration of microbes, toxins, allergens, undigested fats, proteins and other food particles and additives to leak directly in to the blood. They attach themselves to various tissues throughout the body, create an allergic response, trigger the destruction of tissues and organs, and create widespread inflammation. The symptoms of leaky gut can range from the mild to the very serious depending on the extent of gut wall damage. The most common symptoms relate to the digestive tract and can include diarrhea, constipation, bloating, gas, abdominal pain, food sensitivities and intolerances. Other common symptoms are depression, anxiety, fatigue, memory loss, insomnia and mood disorders. There are also skin problems associated with leaky gut because the body can use the skin as an outlet for toxins. Examples of this could be acne, eczema, psoriasis, unexplained rashes and itching and puzzling skin infections. How Can it be Holistically Managed? The successful treatment of leaky gut syndrome and related disorders involve removing the triggers that irritate, damage and inflame the lining of the small intestine. In most cases, food allergens and food chemical sensitivities (e.g. lectins and phenolics) must be identified and treated (see AllerCease™, microbial infections resolved, toxins and heavy metals removed, and a gluten-free diet initiated. To repair the gut lining, I consider it mandatory to introduce selected proline-rich polypeptides found in organic bovine colostrum; and these must be phospholipid-coated to maximize bio-availability. There is no know better or scientifically proven method to heal the leaky gut that I know of. What improvements can I expect with Holistic Management? As healing begins, the amount of toxins dumped in to the bloodstream will decline, nutrient uptake will improve, and the cells will be able to receive the nourishment they need for repair and replication. Organ function will improve, energy levels with increase and the autoimmune, dermatological and gastrointestinal syndromes can start resolving at long last.